I recently saw Trisha Yearwood making this and it looked so yummy and caramelly that I thought "Hmm..I'm gonna have to try this.." (caramelly?) 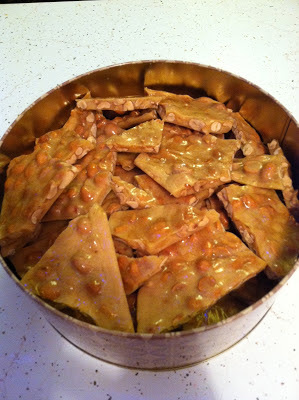 Then I saw on FB that my friend Abbe was about to make peanut brittle so I texted her that Trisha Yearwood has a good recipe, and she responded "That's the one I'm making!" Great minds, huh? So of course, I asked her to take a picture of her final product, and here we are! Just like I said, it's yummy and caramelly and so festive! But you don't have to wait until the holidays to make it. Make it any time! Measure the vanilla into a small bowl and set aside. Combine the baking soda and salt in another small bowl and set aside. Butter 2 cookie sheets with sides or jelly roll pan liberally with 1/2 stick of the butter. Set aside. Combine the sugar, corn syrup and 1/2 cup water in a large saucepan. Bring the mixture to a boil, attach a candy thermometer and cook over medium-high heat until the syrup spins a thread when poured from a spoon or reaches 240 degrees F on the thermometer. Stir in the peanuts and continue cooking and stirring until the candy becomes golden brown or reaches 300 degrees F.
Remove from the heat immediately and quickly add the remaining 1 stick butter and the vanilla, baking soda and salt. Stir only until the butter melts, and then quickly pour the brittle onto the cookie sheets, spreading the mixture thinly. When the brittle has completely cooled, break the candy into pieces and store in a tightly covered container. Instead of buttering the baking sheets, you can also use silicone baking mats. Nothing sticks to 'em! Be sure to take the time to measure out the ingredients and put them in small bowls before you start, just as the recipe directs. Once you reach 240 degrees, things go very quickly and you don't want to spend the time measuring things. And one other thing... I know I don't have to say it, but I'll say it anyway. This gets VERY hot so PLEASE be careful and make sure your little ones aren't around when you make this! There. I feel better now. This recipe is the BEST EVER! I use the 1 Tablespoon each of soda, salt, and vanilla. Many of the recipes call for teaspoons but the TABLESPOON of each is what works for me...and the candy thermomenter, of course.